Trading fairly: Chair of Studley Fairtrade presents a certificate to Hazel Wright on behalf of the Coffee Break Team watched by Mary Stanley, Gill Arthurs, Brioney Smith, Carol Smith and Barbara Beaman. THERE was much delight in Studley after the Fairtrade group celebrated the anniversary of it becoming a Fairtrade Village. Along the way they’ve been championing the rights of farmers in developing nations around Studley and local people have responded by buying into it in a big way. 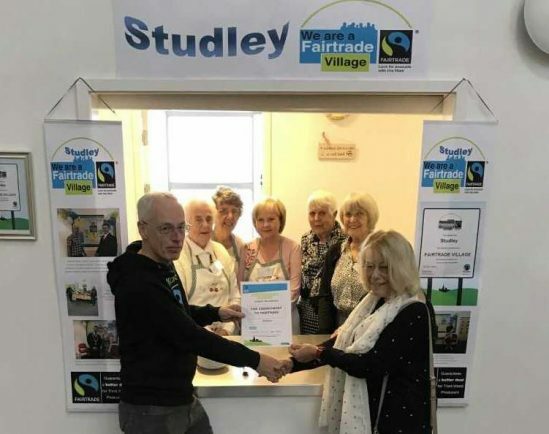 As part of the celebrations, Gordon Marshall, chair of Studley Fairtrade Campaign, presented Studley Village Hall Coffee Break team with a certificate in recognition of their commitment to providing Fairtrade refreshments at their morning get togethers on Mondays and Tuesdays from 10am. “We are very proud of our Fairtrade Village status and our commitment to the values of the movement: fairness, justice and empathy,” said Gordon. “This fantastic milestone is a collective achievement and reflects the continued support of local campaigners, businesses, retailers and community groups. Adam Gardner from the Fairtrade Foundation said: “We all have huge power to change things for better through our shopping choices and business practices. To find out more and join the local steering group, call Lesley Gailey, parish clerk on 01527 853204 or email clerk@studleyparishcouncil.org.uk.